Especially for removing sand in the intestinal tract and to compensate for chronic digestive disorders in the large intestine! Complementary feed (dietary feed) for horses. Zand-Weg contains the fiber-rich source of psyllium and supports good bowel function. Zand-Weg forms a jelly-like mass in the intestines and bonds accumulated sand to the manure and then leaves the horse's body. Psyllium for sand removal and support for bowel function. When does the horse suffer from accumulated sand? This is easy to test by filling a half bucket with water and adding 5 to 6 manure balls. Leave the bucket for an hour and then check the contents. If more than 1 teaspoon of sand is on the bottom of the bucket, the horse has received too much sand. 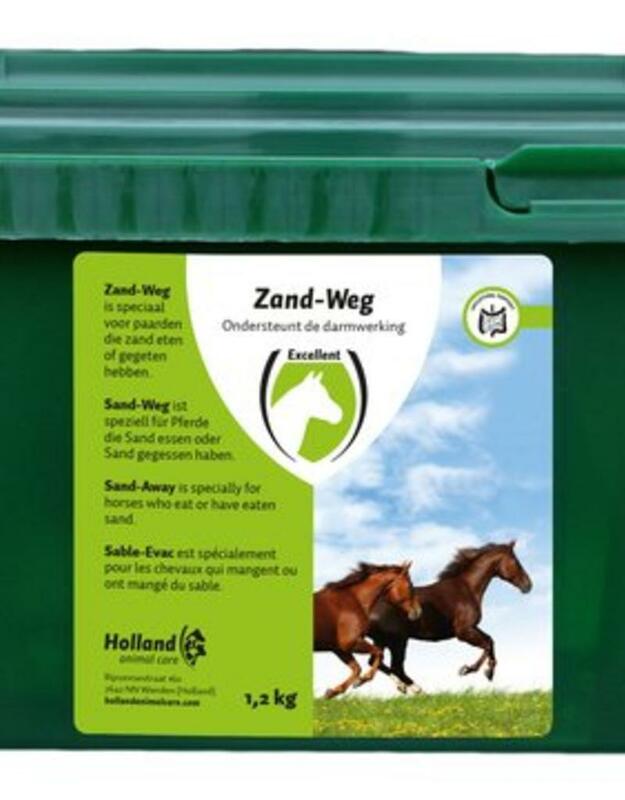 The advice is to give the horse Zand-Weg , to prevent, among other things, bowel discomforts! Horse up to 450 kg: 50 g twice a day for 6 days. Horse from 450 kg: 100 g twice a day for 6 days.